Medallion pattern flags are some of the most exciting and visually captivating flags in all of flag collecting. Each flag seems to have its own unique traits, and it's precisely this kind of variation that makes the pursuit of collecting so exciting. The height of medallion flag manufacture was the period of the American Centennial in 1876, but by the 1890's flags made in medallion patterns, especially those made of pieced-and-sewn construction, all but disappeared. That's one of the reasons why this spectacular flag, in the 48 star count, is so intriguing and rare. It dates to the period circa 1912, and qualities of the flag, such as the presence of three corner stars, presumably in order to fit such a large number of stars on the flag, is a rarity even among medallion type flags. The large center star, larger corner stars, and tight wreaths where the stars are nestled against each other are all fantastic traits to see. The flag is made entirely of cotton, and the stars of the flag are single-appliqué, which means that the canton of the flag was cut through, and a single piece of cotton fabric was used to make each star. From the reverse, the stars "peek through". The entire flag, including the stars, is machine stitched. Machine stitching single-appliqué stars could not have been an easy task, and the precision and workmanship is exceptional. All evidence, including close examination of the stitching of the corner stars and comparison to the stitching of the inner wreath stars, is that the canton was made as designed, in a 48 star count. 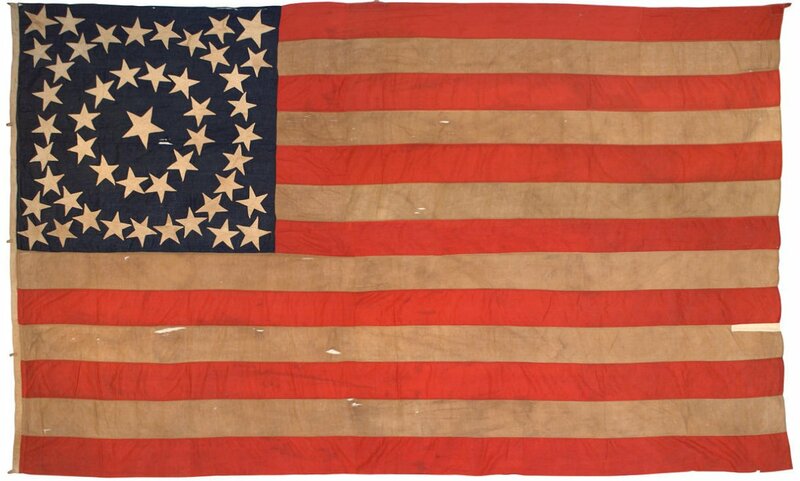 It's tempting to try to place the flag in an earlier period by speculating that the 12 corner stars were added later (making the original flag 36 stars, which is also a high point for medallion flag making). But this is not the case. Upon close examination of the fabrics and stitching it is evident that the entire flag is original and as designed. Along with IAS-00002, is one of just two 48 star medallion flags that I am aware of, and it is a spectacular rarity that pays homage to earlier examples of the type.